yes sorry for no posts this week…was in sweden for a wedding and now off to a job in Italy with New Kid shoes. The shoes are amazing, Only one pair I wouldn’t love wearing, and those I would still like wearing. Gonna pour down though so we will have to hoist a sun and create a forcefield a la captain janeway. Yes she is my favourite captain, she is katherine hepburn, captain kirk and isabelle huppert all in one. 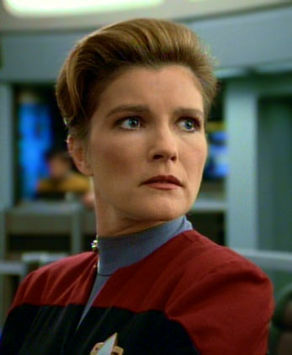 Kate Mulgrew did a bang up job. here she is, back next week with jon norway fishing photos, sweden stuff and italy capers! capers not capers! Voyager was sorely underrated, definitely. I loved Janeway, definitely an air of Katharine Hepburn in space to her, searching the stars looking for an alien Cary Grant. I have Uhura’s communicator noise as my text alert. Don’t tell Joni though, she would mock me mercilessly.